Great for making "pollo asado" or rotisserie chicken. 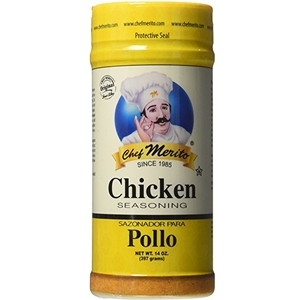 This is Chef Merito's second most popular seasoning and if you dip the chicken in orange juice or pineapple juice first then sprinkle this seasoning, your guests will not stop eating. Ingredients: SALT, MSG (A NATURAL FLAVOR ENHANCER DERIVED FROM CORN OR BEETS), GARLIC, PAPRIKA, ONION, BLACK PEPPER, CUMIN, WHITE PEPPER, SUGAR, ANNATTO, FD&C YELLOW 5, SILICON DIOXIDE, PAPAIN, AND NATURAL FLAVORS.